Congress Talks and Trump Rants -- It's Not Just About the Wall! While Donald Trump continues to make his demand to build "the wall", members of Congress are conferring on a possible "deal" on the budget before Feb. 15 -- the deadline set for the suspension of the government shutdown. Some Democrats in the conference process are floating funding "incentives" in appropriations for the Dept. of Homeland Security based on a "smart wall" -- with use of more technology (and the glee of the tech industry) -- along with increases in the border enforcement budget for everything except wall construction. We cannot agree to these dangerous enforcement proposals, and as we have also repeatedly stated, "It's not just about the wall"! Trump's call to "build the wall" has always been a rallying cry to his supporters to oppose immigration -- ALL immigration. Increases in enforcement personnel, surveillance technology and other infrastructure fuel the consolidation of deterrent immigration policies and will contribute to greater harm of migrants and the environment. This is not acceptable. 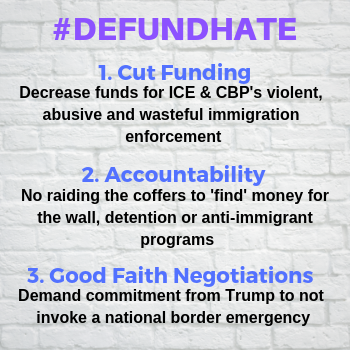 Cuts, not increases funding for violent, abusive, and wasteful immigration enforcement; funding for Immigration and Customs Enforcement (ICE) and Customs and Border Protection (CBP) should be decreased and there should not be ANY funding for barrier construction. The prohibition of the Trump Administration from raiding other accounts to increase availability of funds for a wall, immigration detention and other anti-immigrant provisions. This is also an issue of accountability for federal spending. A commitment from Trump not to invoke a national border emergency or undermine Congress' role on budget matters by seizing funds from other accounts to build the wall or other physical structures. Trump continues to say that the Congressional negotiations are "a waste of time", hinting that he "could" declare a national emergency during his State of the Union address on Feb. 5. Continue to voice our opposition to the wall AND increased border enforcement! Click here for contact information to send a message to your representatives in Congress. Sunday, Feb. 3: Allied Agendas for Troubling Times NNIRR joins a panel hosted by the Workmen's Circle/Arbeter Ring Northern California to discuss how we can build alliances towards a more just and environmentally sustainable society and world. Tuesday, Feb. 5: KPFA coverage of Trump's SOTU. NNIRR ED Catherine Tactaquin and other guests join KPFA's Mitch Jeserich to provide analysis and commentary following the address - listen in! Radio KPFA, Jan 22 Interview with C. Tactaquin on the Republican Senate proposal, the "End the Shutdown and Secure the Border Act"
Our Struggles Are Connected, Updates from the US-Mexico Border, a Jan. 10 event hosted by NNIRR,The East Bay Local Development Corporation, East Side Arts Alliance, Chiapas Support Committee and Class Conscious Photographers. 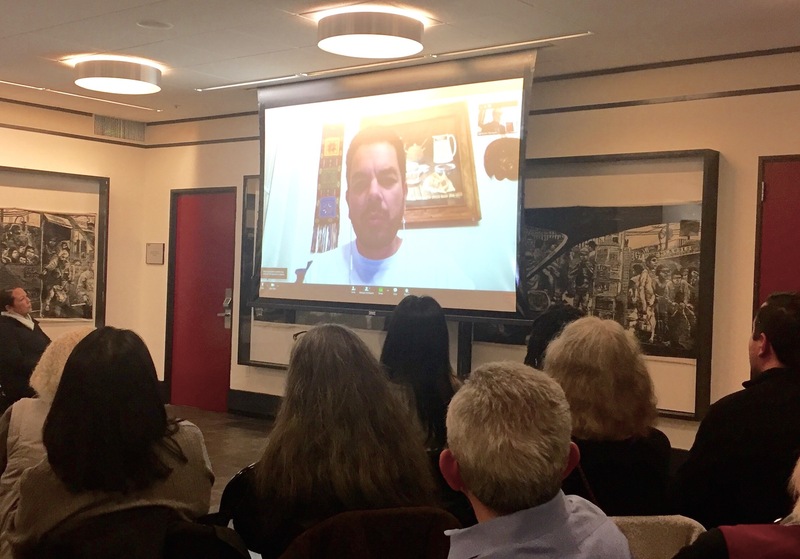 Pedro Rios, with the American Friends Service Committee in San Diego, joined us through a live feed, providing an excellent update on the border situation - coincidentally, the same day as Trump's brief visit to the Texas border. People Get Ready II - Jan. 20 in Berkeley, CA: Catherine Tactaquin joined a provocative panel, "Land: The Basis of Freedom, Justice and Equality", to make the connection with today's debate on the border and speak to the effects of climate change on land use and availability, population displacement, and migration.